"There can't be any argument, any dispute, that is worth so many people's lives. So much blood. There's something monsterous, evil, mad about it all, and its all bolstered up by people here not knowing what it's really like, like some fast confidence trick. You see, even now I can't really tell you how awful it is. We perpetuate the lies, even from out there." 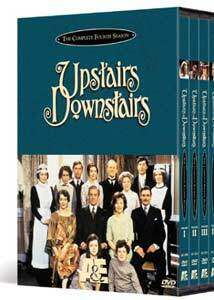 The fourth season of Upstairs, Downstairs takes place between 1914 and 1917, during the Great War. Underscored by its constant presence, the tone of this season is darker and more ominous, as the fear and uncertainty of these trying times affects the lives of the characters. The Bellamy household, and indeed English society as a whole, is undergoing irreversible changes. At its inception, the war is more a nuisance to the aristocracy than anything else. Their idea of contributing to the effort means sacrificing some of their servants to the army, which is most inconvenient to the better houses. Society ladies gather at tea parties and form various committees, many with good intentions, but still clinging to the class distinctions they have been accustomed to. For the downstairs staff, their entire existence is in a state of transition. At the start, the young men are itching for the call of combat, as their naïvété about what awaits them is fueled by a swelling patriotism. Those not being shipped off to the battlefields are leaving the house to work in factories, or aiding in the homeland security services. There is a new sense of duty above the household. In the younger staff, there is also a growing resentment of being treated as second class citizens, as on the battlegrounds their blood runs just as red as their betters. Upstairs, Downstairs brilliantly lays out the era of the first World War through the eyes of the Bellamy household, as the experiences of the different characters provide diverse vantage points. Richard Bellamy's position in government shows the wheeling and dealing on the political side, while James Bellamy's army command and Edward's service in the rank and file contrast the military stories untold in British newspapers. The women's contribution to the war is also covered, with Georgina's work in nursing, Rose's position as an omnibus conductorette, and Ruby's munitions work. There is ample time afforded in depth character exposition, with specific episodes focused on each role, while maintaining an overall momentum, tying the season together. As has been the case since the first season, Upstairs, Downstairs integrates the goings on in the outside world extremely well, as major historical events wind their way into the storyline. The budgets did allow for a moderate amount of location shooting which adds to the atmosphere, from the platforms of the train stations where young men are being shipped off to battle, to the field hospital in France where one of the major story arcs takes place. This season is very consistent in terms of production quality, performance and scripting, leading to few episodes that seem below par. While not all contain a lot of action, each contributes by adding important depth. Producers Rex Firkin (executive) and John Hawkesworth once again earned Emmys for Outstanding Limited Series, with Jean Marsh (Lead Actress in a Limited Series) and Angela Baddeley (Outstanding Continuing Performance) both receiving nominations. The serial nature of the program is kept intact, and with the DVD release, allows a quick resolution to the cliffhangers found at most show finales. The packaging again contains a number of spoilers, which I have tried to keep to a minimum in the synopsis below, but some couldn't be avoided. Edward: You don't seriously think the zeppelins will get as far as London, do you? Mrs. Bridges: Well if they do, I'm going to climb up the string and stick [a] hat pin in them! With the German army advancing in Europe, and the fall of Antwerp imminent, the world of Eaton place is undergoing adjustments. Blackout curtains are hung, and Hazel has joined a committee for the relocation of Belgian refugees, agreeing to take some in. When their Belgian guests arrive, things aren't quite as expected, throwing the household into disarray. With talk of what families of privilege should do to help the war effort, Lady Berkhamstead (Joyce Heron) suggests that Edward should be sent into service. Another pointed example of the aristocracy at work, bemoaning the inconvenience of allowing their servants to be sent off to fight. The staff and the audience get their first taste of the atrocities of war. The papers list growing casualties daily, as the war deepens in Europe. James returns home with disturbing news from the front, which Sir Geoffrey (Raymond Huntley) sees as just the tool needed to topple the government. Edward also returns to Eaton Place on leave after enlisting, but Hudson is put out by his presence, especially when the boy makes a surprise announcement. The political maneuverings provide a set up for what will follow. For both James and Edward, this episode makes an interesting contrast with those later on. With the sinking of the Lusitania, anti-German sentiment is growing as the mood of the country darkens, while government factions are asking for interment of German descendents. Downstairs is abuzz with tales of spies and espionage, fed by reports in the papers Hudson has been relaying. As everyone tries to find their place in the war effort, their choices aren't necessarily greeted favorably by the rest of the household, as a local baker (Gertan Klauber) becomes the center of concern. More of the political angle is exposed, as is the effects of propaganda on the populace. Gordon Jackson won an Emmy for his performance in this episode. Zeppelins are over British soil. On leave before shipping out to France, Edward and Daisy are set be married. As the hours count down before he joins the rest of the conscripts heading into battle, Georgina asks one of her officer friends to give Edward some words of encouragement, but the rest of the house is uneasy about his departure. Meanwhile, James is having trouble adjusting to his new job in command. Georgina gets her first real taste of war, and signs up as a nurse. Ruby has a surprise announcement of her own. Georgina's character matures in this episode, finding her place in the new era. Changes in the attitudes of downstairs staff are also introduced. Christopher Hodson was nominated for an Emmy for his direction. With Edward in France and Ruby working for the war effort, staff downstairs is getting pretty thin, and Daisy is growing increasingly annoyed by the extra work. Georgina is unprepared for the workload of her new position at the VAD, especially when she is put in charge of two new aristocratic volunteers. James is home on leave, frustrated by his staff posting, and lobbying Richard to pull strings to get him back to the front, but his efforts aren't going over well with his wife. The attraction of work outside the house has Rose eyeing her own contribution to the war effort, much to Daisy's chagrin. Mrs. Bridges is away. Hazel's feathers are ruffled when Prudence imposes on Eaton Place for one of her society undertakings, putting her at odds with Richard over control of the running of the house. A face from the past returns when Rose's former fiancé, Gregory Wilmot (Keith Barron), turns up, setting Rose's feelings akilter, but when Hudson interferes in her relationship, her future happiness is jeopardized. Hudson is not prepared for the consequences. Jean Marsh gets a chance to take center stage as her character comes to terms with her only hope for a life outside service. Lady Berkhamstead's tea party for wounded officers introduces Hazel to a young aviator (Andrew Ray), with whom she embarks on a torrid affair. Downstairs, Rose gets a chance to give Hudson a bit of his own for his disapproval of the lady of the house's behavior. Georgina has gone to France to nurse on the front lines, where she meets up with James, who is preparing for what could be the biggest battle of the war. This episode lets Hazel's character develop, while also featuring a good amount of location shooting. Their men overseas, the women of Eaton Place anxiously await the post, but there is tragic news from France, when Rose learns her fiancé has been killed in battle. The downstairs staff doesn't know how to console her, however Mrs. Bridges suggests she visit a medium. Rose is not the only one needing consoling in the Bellamy household, leaving Hazel in an awkward position when James returns home on leave, distraught over his loss of conviction for the war. While not a lot happens in this episode, many of the characters get the spotlight, with extended exposition of their thoughts and history, and more than one secret is revealed. Another year has come to a close at the Bellamy residence. Richard has his doubts about why he's been offered a viscountcy, while a tenacious woman seeking his assistance with her cause ruffles feathers with his superiors. Edward returns home on leave, but he's not the same innocent young man who left to fight the war, haunted by what he has seen in battle. Alfred Shaughnessy was nominated for an Emmy for his scriptwriting on this episode, which marks the first appearance of Virginia Hamilton. Lady Fairfax is conspiring to find a location for the performance of an historical tableaux, and has chosen the drawing room at Eaton Place. With Hazel away, Richard is put on the spot, and Rose becomes infatuated with a renowned actor. Downstairs, to the chagrin of the rest of the staff, the menu has taken a patriotic turn after Mrs. Bridges is encouraged to attend a lecture on rationing. As plans for the tableaux progress, the staff is drawn into the production, but the war is never far away. After some of the more serious installments, the frivolity of the upper class during the first half makes for a nice break, with Joan Benham providing great comic relief. The levity is short lived, however. The Bellamy household is under a black cloud when James is reported missing in action and presumed dead. His servant returns his personal effects, delivering an account of the events leading up to his disappearance. When he finally turns up wounded, Hazel pulls strings to hire a private ambulance to bring him home, which Richard fears may lead to charges of professional impropriety. To retrieve James, Hazel and Richard head to France, where Georgina has been nursing him, leading to a disagreement between the two women. Much of this episode takes place on location. Trooper Frederick Norton (Gareth Hunt) makes his first appearance. Hudson's patience with the staff's pessimism over the war has come to a head. Upstairs, Virginia Hamilton has returned, with news her son is facing a court martial, and Hazel urges Richard to lend a hand. Mrs. Bridges is fed up with the rationing that is destroying her culinary creativity. James is becoming increasingly irritable at his perceived lack of attention and the house's short staff. With the Americans in the war now, the draft has been called, but Edward has gone AWOL, a crime punishable by firing squad. Sir Geoffrey Dillon plays a central role in this installment. After four grueling years, the war is coming to an end, but Eaton Place will not see it over without major changes in the household. Rose receives word she has come into an inheritance, while correspondence upstairs has the servants talking, and Richard off in a hurry, to make plans for a new future. Georgina returns home on leave with word of a serious flu epidemic that is sweeping the country. James has become insufferable, and tension between he and his wife is growing. When Hazel falls ill, he has to reevaluate his feelings. The final episode bookmarks another chapter in history, and is a prelude to Season Five, as the fabric that was once a noble household begins unravelling. The joy of peace is tempered with the last somber events, as the family and staff contemplate their futures. Image Transfer Review: Like the first three seasons, much of the video here is well below standard quality, due primarily to the condition of the source elements, which have not fared well over the years. To their credit, A&E, does make mention on the outer box to expect a sub par presentation, despite their efforts to locate the best quality source material. The gamut of video defects can be found somewhere during the 11 hours presented in this set, from a few major analog dropouts to stuttering, digital tape defects, and ghosting. The look once more tends to hue to green, the image is soft throughout, and generally murky in shadows. There is some flaring, and fair amount of color bleed. Shimmer is abundant, as is cross-coloration on fine detail. Despite these problems, there is still a majority of the program that, while not perfect, looks quite reasonable considering the video tape origins. Colors are respectable and stable. In the later episodes there are notable abrupt cuts from the commercial break, leading me to believe a title card has been excised. Audio Transfer Review: Mono audio does its job, but is not without its own share of source-related issues which, for the most part, are minor. There is a fairly constant hiss throughout, though the second installment has a persistent whine in the background, and there is an assortment of pops and crackles that appear sporadically. Distortion is limited to a few occurrences, and any major anomalies coincide with a video defect. Dialogue is discernable throughout, with few instances where it is incoherent. As mentioned in the video segment, the areas immediately following commercial breaks seem to be missing some footage, as the audio cuts in with tailings of the theme music. Extras Review: Once again, there is a complete dearth of extras, with only six chapter stops afforded each episode, and the main motion menus. Spoilers abound on the packaging, this time a teal box housing the four disc collection. I would have preferred if the artwork had been designed with the actual cast in mind, since two of the four disc covers feature actors that haven't been on the show since the second season (John Alderton and Pauline Collins), and the box cover is the cast from season five. Considered by many to be its finest season, Upstairs, Downstairs continues to deliver superb period drama against the backdrop of the first World War. The cast all give first rate performances, and the scripting and direction leaves little room for languishing. As has been the case with the first three seasons, the only real disappointment has been the state of the source elements, which detract from the otherwise exquisite production. While in my view deserving of a restoration effort, at the end of the day, the quality of the storytelling, and rich characterizations overshadow any technical deficiencies in the transfer. This is drama at its best, and I am thankful to be able to enjoy it on DVD.